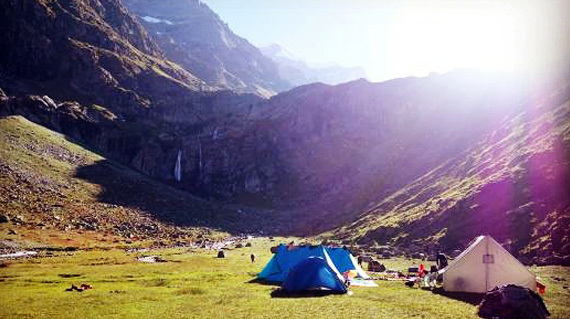 The Deo Tibba Base Camp trek is the quintessential Himalayan trek. If you wish to experience the beauty of these holy mountains in its true avatar, look no further than the DTBC trek. The picturesque trek takes you through the ever-changing landscapes, and presents a new canvas at every few steps. You start from dense oak and deodar forested trails, and slowly venture into the lush green meadows and grazing pastures of the Gaddi shepherds. 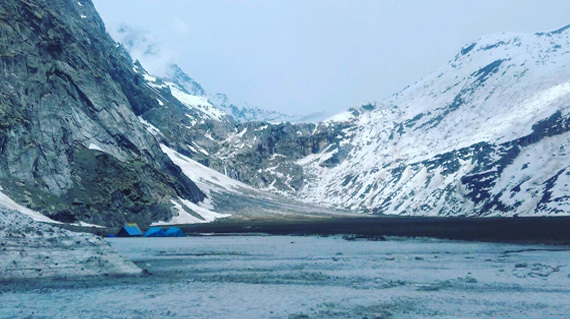 With a splendid view of the cascading waterfalls and moraines on the way, you come across the emerald blue waters of the Mini Chandrataal, a heavenly high altitude lake. And the bewitching views of the stunning Deo Tibba Peak and its huge hanging glaciers..Well, some moments cannot be described..They can only be experienced.. 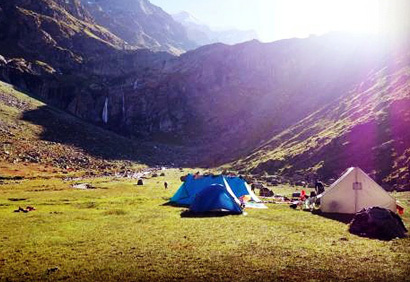 The spectacular DTBC trek provides you a tantalizing experience, and will leave a mark in your mind and heart..Forever.. We assemble at Rambagh Circle at 9am. After a round of introduction, the trek leader will brief us on what to expect in the next few days. We board the veichles, and drive 12 kms to Ad Hydro Project tunnel point, which is the starting point of the trek. The 3 km trail is a gradual ascend, and passes through thick pine forest. The campsite at Chikka provides some beautiful open views and some great options for long walks in the serene surroundings. It's an easy and gradual ascend of 4 kms through a lush green valley to Dudu, our campsite for the day. Today's another day of a moderate 4 kms trek through the changing landscapes. As you gradually gain elevation, you can see the tree line disappearing, and giving way to the vast meadow of Seri, that was once a glacial lake. The campsite is undoubtedly one of the most beautiful ones in these parts. With some gushing streams to accompany you, the site offers panoramic views of the Tainta waterfall and the Jagatsukh Peak. It's the longest and the most important day of the trek. We take an early breakfast and make a move. 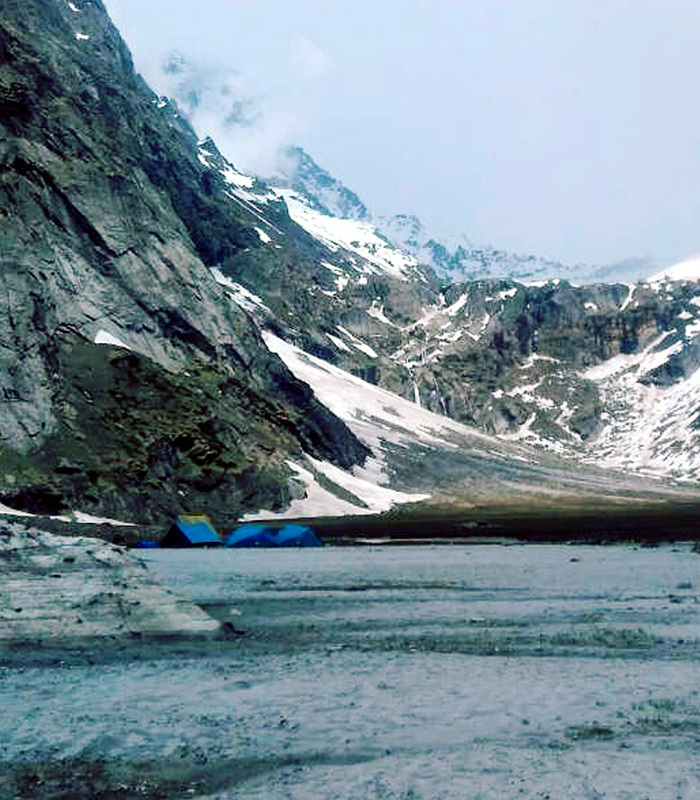 We cross the Jagatsukh Nala, do a steep climb through the boulders, and reach the moraine fields. The Deo Tibba is now fully visible, and shines in its full glory. We break for some time to admire the might and beauty of the mighty peak. We continue further through a stretch of moraines, and after a final stretch of steep climb, reach the shore of the stunning high altitude lake. Spend some time and explore the serene surroundings. We then start the journey back to the Seri campsite. We return to Chikka campsite. Bonfire and special food at night. We take the same route and descend back to AD Hydro Project tunnel point, the starting point of the trek. We board the waiting veichles and drive back to Manali.